Your skin is made up of Elastin. Elastin is the main protein involved in creating the elasticity of your skin. When you get older the Elastin breaks down and causes your skin to loose its ability to bounce back. LED light therapy is very powerful and the high-intensity light causes a change in your molecular structure of your water layer in your skin. This ends up freeing up the Elastin in your skin and replenishes the elasticity your skin once had! The Red LED light is the most powerful and effective way to create collagen and elastin. Fine lines and wrinkles have everything to do with a lack of collagen and elastin. The Anti-Aging LED lights penetrate into the dermis layer of the skin, energizing the cells, thereby helping to create collagen and elastin, much the same as when you were younger. Collagen helps to plump up the skin, while elastin helps to make the skin more firm, thus diminishing fine lines and wrinkles. It’s actually that simple! LED Light Therapy or Light Therapy is the use of light to create an anti-aging effect on the skin and is quickly becoming recognized as one of the safest, fastest and most affordable ways to achieve younger, more vibrant looking skin. It’s referred to by several different names; LED Light Therapy, light therapy, etc. ; it’s all the same thing! If you have been plagued by small bumps, blemishes and redness from Rosacea, this is what you’ve been looking for! LED Light Therapy helps with the reduction of redness, small bumps, blemishes and smoothing of skin tone. Smoothes fine lines and wrinkles while firming skin, shrinks enlarged pores, clears acne, reduces inflammation, diminishes discoloration and fades scares. The combination of red and blue LED light is a documented therapy for the control of acne. LED is powerful combination of red, infrared and medical grade blue LED lights that not only kill the acne causing bacteria, but reduce inflammation and help to prevent future breakouts. 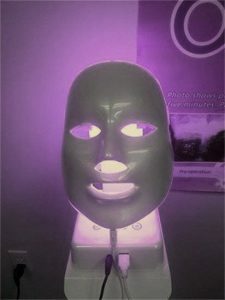 Blue LED is recommended to help diminish and control acne. Perfect for those who want to take a proactive stride towards optimum acne skin care. Great alternative to oral medications. The combo of Red / Blue (pink) is the most effective on acne since it both kills the bacteria and take away inflammation. It is also the most effective for treating Rosacea. Most treatments are 20-30 minutes. Face should be completely clear of all make-up. Red light can be used with chemical masks but not the mask you apply as a paste or mix yourself. Red light speeds up healing, regenerates collagen and helps greatly with inflammation. Blue light kills the bacteria that causes acne.